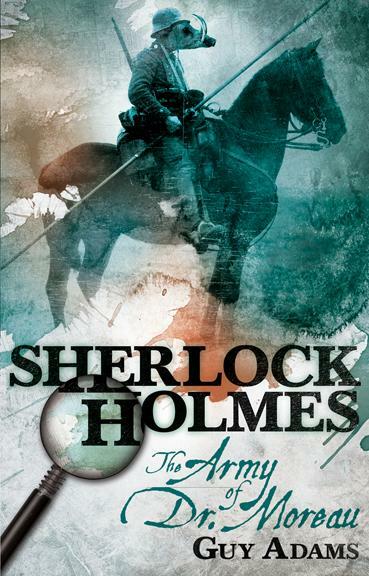 Fruitless Pursuits: Book Review: Sherlock Holmes and the Army of Dr. Moreau! Book Review: Sherlock Holmes and the Army of Dr. Moreau! Our latest offering from our friends at Titan Books is Sherlock Holmes and the Army of Dr. Moreau by Guy Adams, a Victorian literary mash-up that pits the two classic characters against each other in London’s seedy underbelly. Set years after the sinister events that once rocked that notorious Island, a slew of bodies - all mutilated by exotic creatures - lead Holmes’ portly brother Mycroft to suspect that Dr. Moreau - once contracted by a secret Government agency to attempt to infuse human soldiers with animal abilities - is still alive and continuing his experiments. The erratic Holmes and pragmatic Watson are enlisted to investigate the case and soon find themselves knee-deep in a beast-man brouhaha engineered by a bitter mastermind. What did I make of all this? Find out... after the jump! My own experience with Holmes is perfunctory at best, but I was instantly enamoured with Adam’s style. I enjoy the rhythm of Victorian fiction but what I didn’t expect was the level of tongue-in-cheek humour that is prevalent in the text. Much of the banter between the larger-than-life characters is quite funny, which is by no means to suggest that this book is a spoof - it’s not. The adventure itself is quite serious but the characters attack it with such vigorous wit that it makes for an extremely entertaining read. Watson is our primary narrator and his initial chapter provides a both entertaining and useful primer on what we can expect from this particular adventure. Critical of his editors (and the more vocal members of his reading audience) Watson acknowledges that some have trouble accepting Holmes’ and his more fantastical, or supernatural, adventures which may have been thus far swept under the rug. But Watson is willing to indulge in a bit of fun, fantasy excitement right now. It’s a clever device which pays respect to the existing Holmes legacy but gets us in the mindset for a more frivolous departure. Adams also allows a vivid supporting cast to share the spotlight thanks to some multi-page expository monologues that really dig deep into the characters presenting them. There is a brilliantly amusing rant by Holmes’ grubby informant that had me chuckling, and the testimony of our first beastman is both poignant and chilling. Adam’s knows how to turn a phrase and I was consistently impressed with the quality of his writing. I enjoy the merging of the literary worlds of Doyle and Wells and I think it’s great to see these perfectly good classic characters taken off the shelf and played with again. It reminds me to some degree of Alan Moore’s League of Extraordinary Gentlemen, in fact Mycroft does manage to assemble his own club of literary adventurers to assist Holmes, including characters from The Lost World and Journey to the Centre of the Earth, although they are sidelined for much of the story. It lacks the larger scope of Moore’s work, but does conjure up a similar type of feeling, exhibiting a fascination and respect for a history which it is also re-imagining. Although I do wonder how many readers are actually familiar with all of the characters referenced? I found myself pawing through Wikipedia to get up to speed, fearful that important references were sailing over my head. Such an exercise is certainly not required to enjoy this book, but it left me curious for more. I have not yet read Adam’s former work, but it should be noted that this is a sequel to Guy Adam’s previous novel Sherlock Holmes: The Breath of God in which Holmes teams up with Aleister Crowley. If it’s anywhere near as good as this book then considered me subscribed and I do hope that there are further adventures. It also has me keen to delve into Doyle’s original work to see where it all began, making this novel a great gateway for both discovery and rediscovery. I’ve heard rumours that this book may ruffle the feathers of a certain type of Holmes purist (as Watson himself even mentions) but I can’t imagine why anyone would want to cheat themselves out of such a good time. Highly recommended. You can find out more about both The Breath of God and The Army of Dr. Moreau at Titan’s site.